Today I sat down to write my usual monthly E-Dressage update on our progress. 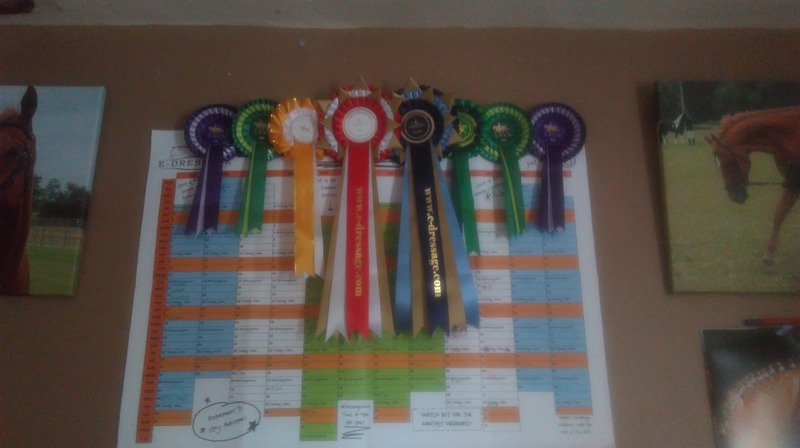 But after getting rosettes today and looking at all the rosettes Scottie and I have won in our 2 years together, I decided to write a very different post. For those of you who don’t know mine and Scottie’s story, I will give you a brief over view. Despite being lucky enough to have parents to pay for and drive me to weekly riding lessons at a riding school from the age of 6, to then twice weekly visits to a yard where I got to ride and share several thoroughbreds, Scottie is my first horse. When I got him in August 2014 he had been out of racing a year already, but you couldn’t say he had received any retraining as such. So I have the pleasure of saying that all of our success is down to my hard work, his fantastic personality and those around me who helped us along the way. In July 2015, after nearly a year together and 1 or 2 riding lessons, we attempted our first dressage show. Having never been interested in dressage, this was my first dressage show as well as Scottie’s, so you could imagine my surprise when we scored a respectable 65% and came 4th. I found E-Dressage at the perfect time for me and Scottie. I had just discovered my love of dressage (which is still a shock to me!) and they were just about to launch their new ex racehorse classes. The idea of there being an ex racehorse class was enough for me to try this new online dressage idea. So I entered my first ever E-Dressage class in August 2015, which also happened to be their first ever Ex Racehorse class. Needless to say I loved the experience and have entered one of the ex racehorse classes for every month since. Unlike my first experience of dressage, E-Dressage wasn’t an immediate success for us. Despite entering every month and improving every month, we didn’t get our first rosette until March 2016. But that is okay, because success isn’t the reason I enjoy E-Dressage. Being a student when I got Scottie, I didn’t have much spare money for regular lessons, transport or competition fees. So, because I didn’t have any competitions or events to aim for, I was lazy and half-hearted in my schooling. E-Dressage gave me something to aim for each month and being the very competitive person I am, I wanted to win! (Or at very least start bringing home some rosettes!) Straight away I found myself putting more work into our schooling and we started to improve massively. Not only did I now have the drive to put more work in, but I also got brilliant feedback from the judges to help me understand where our weaknesses were and the fantastic resources in the vault gave brilliant advice to how to improve and work on certain areas. All these things have helped us improve, so much so that with less than 10 lessons together under mine and Scottie’s belt (with at least 3 of these lessons being jump lessons) since we started our partnership, we have managed to win our first Intro class and have our first placing at Prelim level. I can safely say that E-Dressage has played a huge role in mine and Scottie’s success and I doubt we would have improved nearly as much as we have without finding E-Dressage. We are now starting to have regular success with E-Dressage and I am lucky enough to have one of those weird horses who seems to perform better at shows than at home. So it’s great to know that I can expect to see similar scores when I manage to get us out to actual shows. For anyone who is considering online dressage for their horse, I highly recommend giving it a try as I think there is something for everyone.